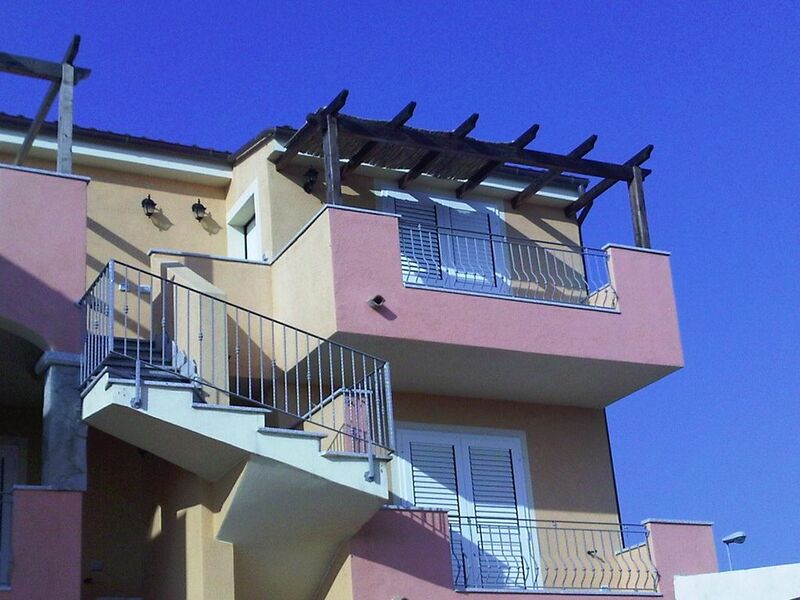 The apartment has about 55m² and 2 balconies (1 large balcony to the sea side and 1 smaller for mountain / sea side). It has 2 bedrooms, one with a double bed, the other is equipped with wardrobe, 1 bunk bed and the cot. The living room has a sofa bed. The bathroom also has a window with partial sea view, shower, toilet, bidet and a washbasin. In the combined living / dining room, the brand new kitchen is with gas stove, oven, dishwasher, fridge / freezer, microwave and full kitchen equipment for 6 persons. In the living area is still a couch and a flat screen TV with 80 cm with satellite TV, a DVD player and a stereo. La Muddizza has a supermarket, a stand with fresh fruit and vegetables, bars, restaurants and a small church. In our street there is also a so-called. Agritourismo mode, where you can good food typical of the country go. Castelsardo (pitoresker place on rocks), Isola Rossa (beautiful bay with a small marina and red rock), river Coghinas with its lagoon to the sea and swimming in the river with its hot thermal springs at Castel Doria, a year-round small Spa at Viddalba, archaeological museum in Viddalba. Surfing (with appropriate wind kite surfing! ), Sailing, swimming, hiking, fishing, tennis, horseback riding, water skiing, snorkeling, jogging, mountain biking, climbing, canoeing, spas, even in the hot springs in the river. The final cleaning is uniquely € 50.-. Including the keys on site, use of sheets, towels, dish towels, if needed also cots with linen included and final cleaning. Appartamento grazioso e super accessoriato. Ottima accoglienza. Appartamento grazioso e super accessoriato. Our beautiful, lneue apartment is on the 2nd floor of a modern apartment complex on a hill in La Muddizza at Valledoria offers from the two balconies a fantastic all round sea views over the bay of Valledoria and also in the mountains. German-language site support; Cots, sheets and towels included free. Valledoria lies approximately in the middle on the North coast of Sardinia and can be reached from the airports as well Olbia Ferry Port (90 km), as well as of Alghero (about 60 km) and Porto Torres (about 45km) from well reached. On request, a Get-up and delivery service can be offered from the airport or ferry to € 50.- surcharge per trip! The immediate area is varied and prolific nature. The Bay of Valledoria has an approximately 14 km long beautiful sandy beach with dunes and the lagoon of the river Coghinas. Other Activities: kite surfing, climbing. In der einmaligen Endreinigungspauschale von 50.-€ ist die Schlüsselübergabe vor Ort, die Benutzung von Bettwäsche, Handtücher (aber nicht Strandtücher), Geschirrtücher und bei Bedarf das Babybett mit Bettzeug eingeschlossen. Maximale Belegung 4 Erwachsene plus 1 Baby plus ggf. Haustier. Privater PKW-Stellplatz ist im Innenhof vorhanden und inclusive. Die Preise gelten bei max. 4 Personen plus Baby.